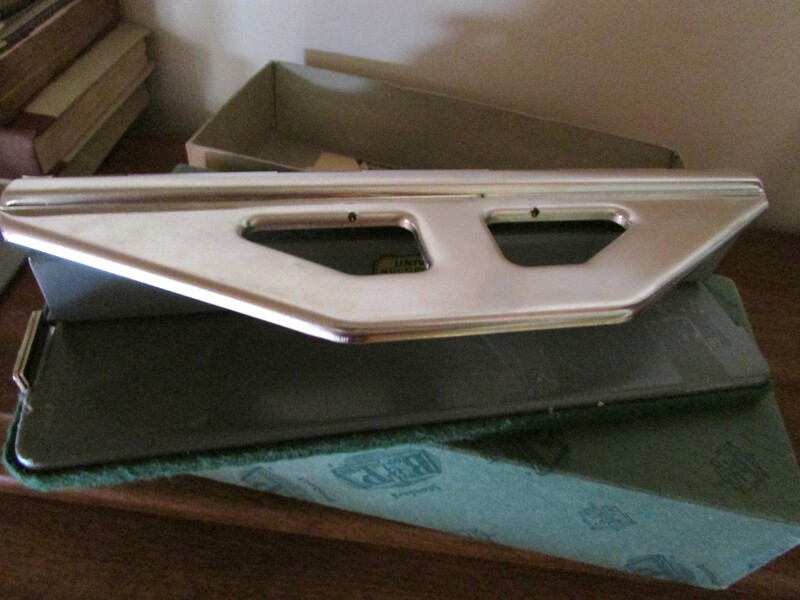 If you have followed this blog, you are aware of my love for vintage items. I love the yesteryear charm of these things, the detail in workmanship, as well as the durability of many vintage objects compared to a similar object manufactured today. In addition, selecting vintage is my way of contributing to the planet by giving a second chance to things, and preventing some of these things from landing on our landfills. As a writer and entrepreneur, I try to create a space that will inspire me during my working hours, but also that is environmentally friendly. Many times, before heading to the nearest staples, I try to plan purchases ahead of time, looking to see if I can find a vintage item instead of buying new. Sometimes, this action saves me money, sometimes it does not; however, it always helps the environment by preventing an item from going into the landfill. Many times, I am buying new old stock (NOS) – new items from the past, never used or that have survived sometimes more than a 100 years and are still in great usable shape. 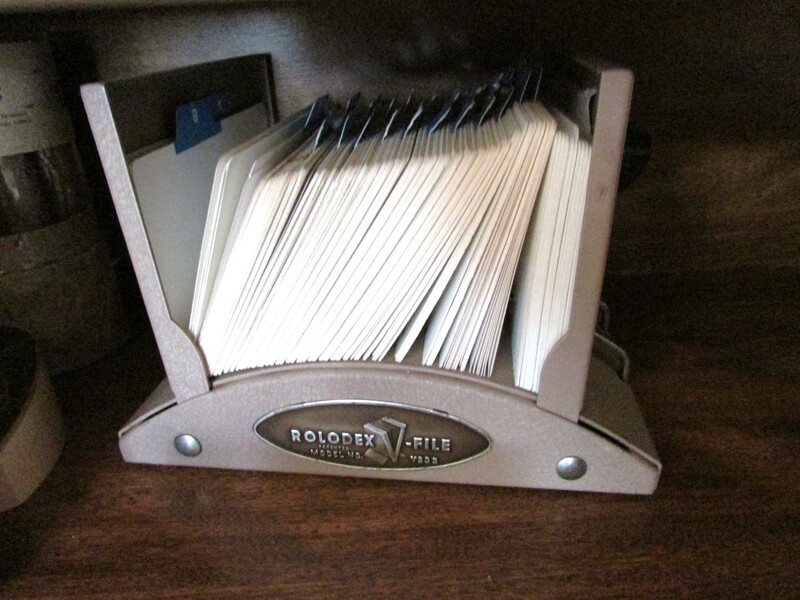 Examples of these items are vintage pencils, hole punchers, metal pencil sharpeners, ledgers, paper, refillable pens, paperclips, card holders, heavy-duty Rolodex and refill cards, note cards … you get the idea. Of course, some things require new technology, which I buy new. The trick here is to plan so you have time to look around; therefore, you don’t make a hurried purchase, which could end up being more expensive. However, Mother Earth is always grateful. 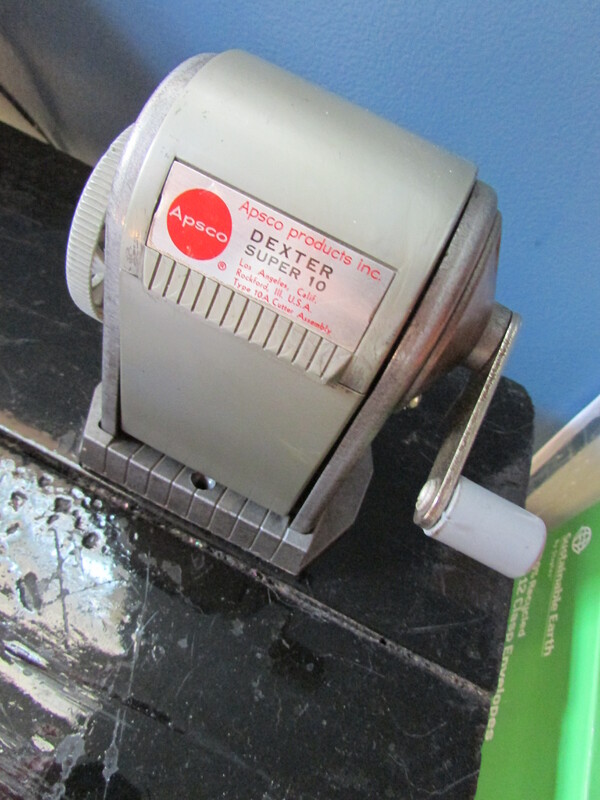 As an example – if you know that you will need to buy a stapler in a few weeks, now is a good time to look. 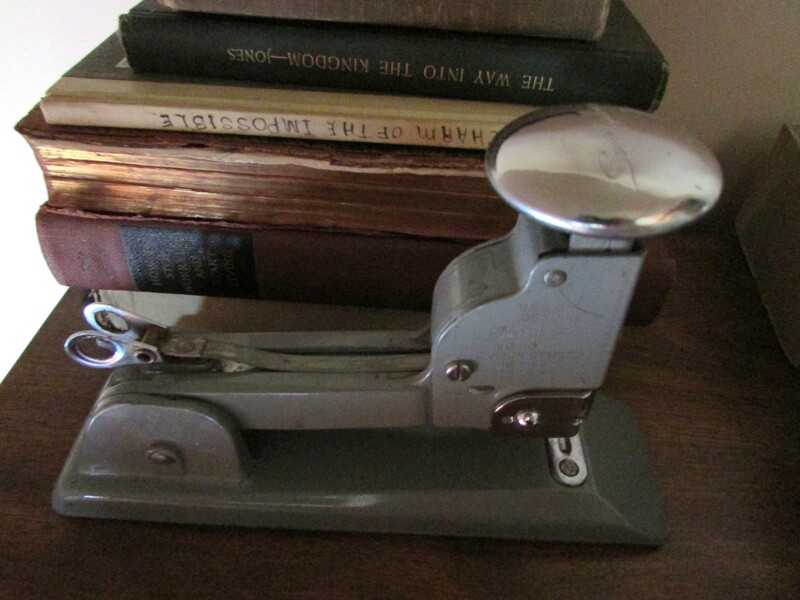 If you need to replace your stapler, the heavy metal vintage ones are excellent and perform well and you can still find original staples online, whether NOS or new replacements. I stress this point, planning a purchase, because let’s face it, if you need something right away, you will not have time to shop, compare, and most likely, you will rush to the nearest office supply store because you cannot wait for delivery. Sometimes the detail in craftsmanship of these items is inspirational in itself – you see a well thought and designed item, proudly displayed, which may inspire you to reach for the same in your work output. So there is an added benefit. If you are a techie who loves the latest gadgets, this post may not be for you, but you can help by organizing your work and schedule electronically, thus reducing much paper output, in a way, which is great too. And since we are in the topic of paper, if you alternate between writing your drafts on the computer and paper, you can use vintage journals or ledgers for that purpose. I have been lucky to find an entire box of NOS copy paper for three dollars. 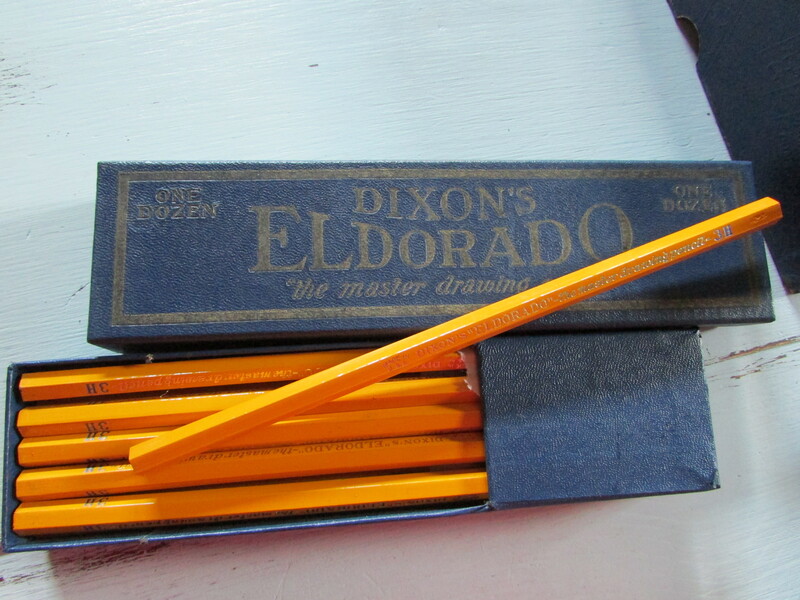 Other great writing materials are fax paper or the old printing paper with the removable sides. Just a few ideas. Here are pictures of some items in my writing/working space. By the way, the desk was a Craigslist buy for $10.00 (no zeros are missing here). 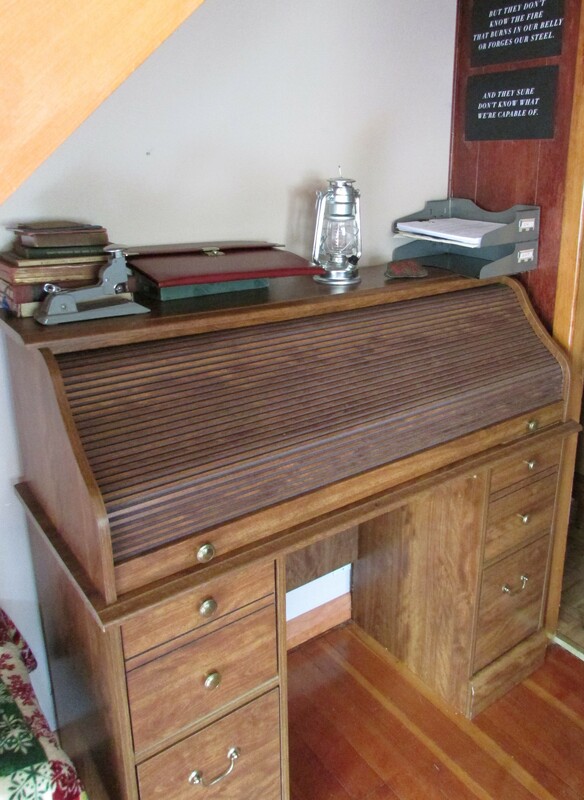 Roll Top Desk – photo by M.A.D. 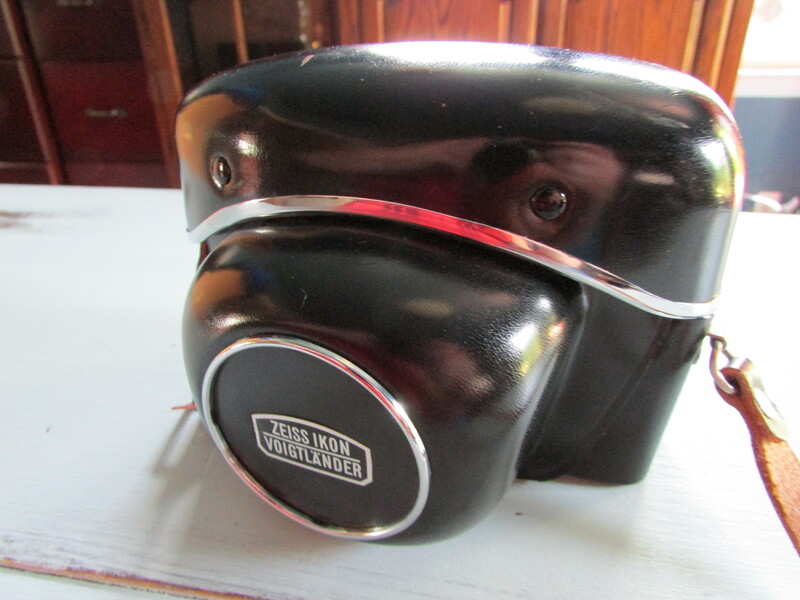 Vintage Camera Case – fits perfectly my Canon Powershot. Photo by M.A.D. 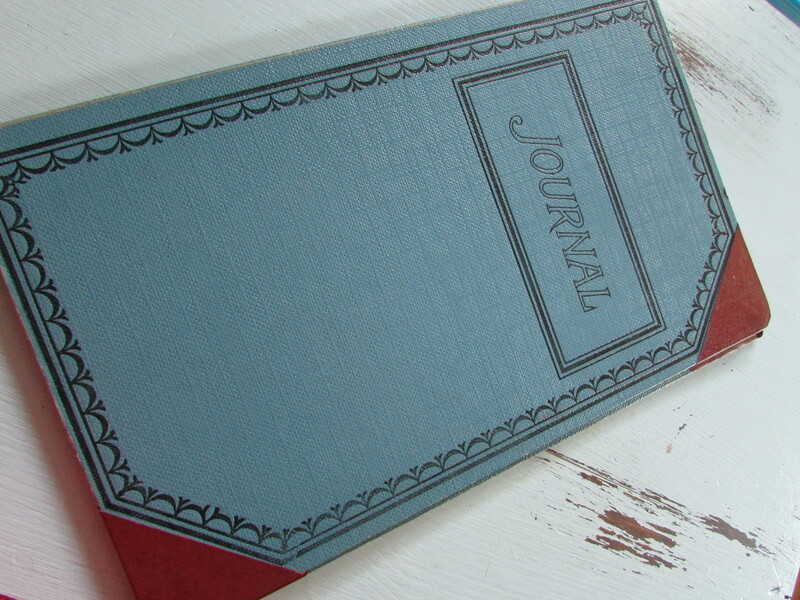 Journal Ledger – Photo by M.A.D. So there you have it; all these items are vintage, some more than 50 years old, some new old stock, but all ready to give many more years of service. I hope you enjoy this post, and that it inspires you to give a second chance to vintage items to help our environment.